Summary: When the young and beautiful Catherine Howard becomes the fifth wife of the fifty-year-old King Henry VIII, she seems to be on top of the world. Yet her reign is destined to be brief and heartbreaking, as she is forced to do battle with enemies far more powerful and calculating than she could have ever anticipated in a court where one wrong move could mean her undoing. Wanting only love, Catherine is compelled to deny her heart's desire in favor of her family's ambition. But in so doing, she unwittingly gives those who sought to bring her down a most effective weapon-her own romantic past. Please enter me! I really want it! This book sounds awesome! 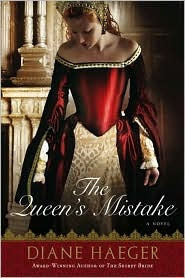 I love books that are based on historical and royal characters. I've been wanting to read this one for a while. Count me in. Please enter me in this one. I got on a Tudors kick last year and have been reading as much about that time period as I can. It's interesting how this little girl that hated history, grew up to adore some parts of it. Please enter me. Since the Tudors came out on Showtime, I've read every book on Henry VIII's wives available. Please enter me in the contest! I love the cover! Sounds good, please enter me for it.. Sounds like a great read. Pls enter me in the giveaway. Sounds cool. I the idea its a queen makes it look cool. Count me in for the giveaway. Sounds like a great book. thanks! I love historical fiction! Please enter me in this contest. Thanks for the donation Kathleen! Been wanting to read this one. Love historical fiction! Looks great, I adore historical fiction. Please enter me in the contest! The dress on the cover is gorgeous. I would love to win this, please enter me. MINE! It shall be MINE! I love books about King VIII and his wifes for some reason. Thanks for hosting these contests. King Henry VIII has always intrigued me. Please include me. I love historical fiction! I love everything Henry VIII!